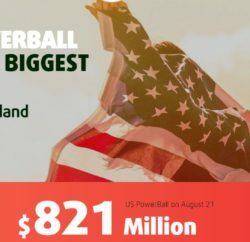 Most of us would have known about the US$1.6 Billion Powerball draw earlier this year (Jan 14, 2016) which was shared by 3 winners. At the current exchange rate that’s AUD$2 Billion ish and divided by 3 is around $650 million each winner. US tax when money goes offshore is close to 50% so if you were one of those winners you would end up with over $300 million. That is 3 times more than the biggest lottery ever held in Australia (at time of writing this Auslotto $100 mil is biggest). But why say this when its an American lottery not open to Australians I hear you say…well that has now changed. Residents of Australia are now able to legally access huge lotteries all around the world by following one of the links that I provide below. Some states residents may not able to use these links due to their local laws. As I write this, there is a $653 million Powerball draw happening in the US in 3 days which most of us would have no idea about. There are also huge jackpots in the Euromillions draws and many other lotteries around the world on a regular basis (several times a week). Why play the Australian lotteries and win 1 million when you can play the same games with the same odds at similar costs and win much much more…often hundreds of millions. So get ahead of the rest of Australia and start playing with the “big guys”. Not only will you have access to world record lotteries, but there is often bonuses for signing up and discounts sent to your inbox. Once signed up you can also use your account to enter local Australian lotteries which will save you a trip to the local newsagent. There is a big difference in the two brands linked below. TheLotter (top banner) has agencies around the world who actually purchase tickets on your behalf and send you scanned copies via your acount. They have paid out many millions in jackpots and been in operation since 2002. Lottoland is very different, they are actually a bookmaker and when you buy your ticket they are treating it as a bet with the same odds as the lottery. This means that when you win, you get paid the same as you would through the lotteries. It is good that they can no longer advertise on TV as I am not sure what would happen if you did win the ‘big one’. The Lotter seems to be legitimate and does not breach any laws in any countries that they operate in including Australian laws, but I always advise my readers to check the terms and conditions before using. I use thelotter myself!! Please ensure you read all of the terms and conditions before signing up.